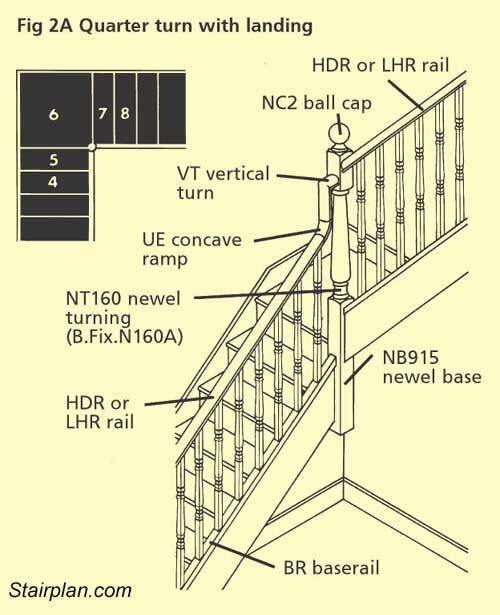 Above you can see the classic volute handrail detail often described as a "monkeys Tale" handrail detail, a Volute is one of the more difficult details to install and the standard detail above doesnt always give the best results, our recommendation is a ascending volute detail, this brings the volute to a lower height making the handrail more comfortable and the handrail will also have a firmer feel. 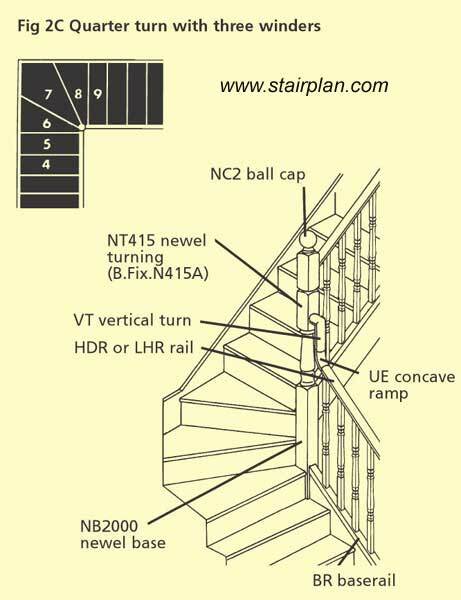 Above you can see a quarter landing staircase using a NT160 in the corner, the use of a NT160 over the Typical NT415 newel turning means you will require a gooseneck detail to the handrail as shown above, this requires a UE up easing and a VT vertical turn fitting, this can give a more classical look to the handrail but this is far more difficult for the installer than using the standard NT415 double stock newel turning detail shown below. 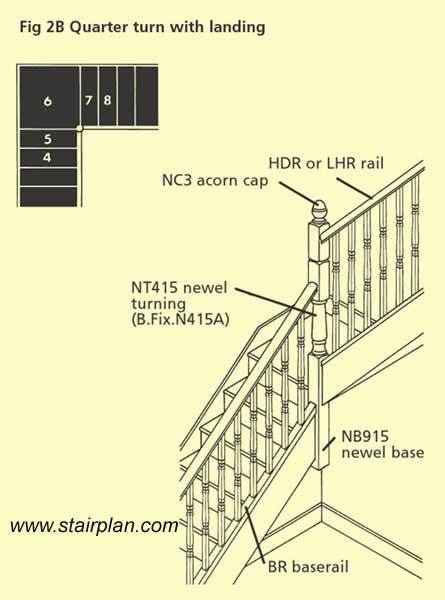 Above the standard handrail detail used at a quarter landing turn, the NT415 Double Stock newel turning is set at a size to allow the lower handrail to go into the bottom stock of the newel turning and then the upper handrail comes out of the top stock, easy to install with Stelten handrail fixings but avoid the bracket fix system. 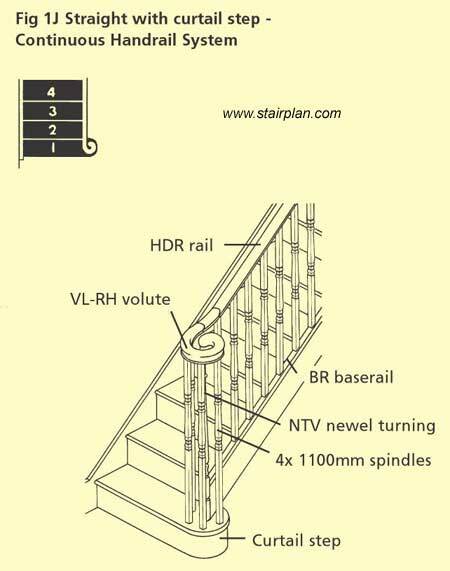 Here you can see a goose neck handrail detail being used on a winder staircase the handrail connections for the UE up easing would be connected using a Handrail Bolt connection and the VT vertial turn and the upper handrail section would be connected to the newel post with Stelten handrail fittings. 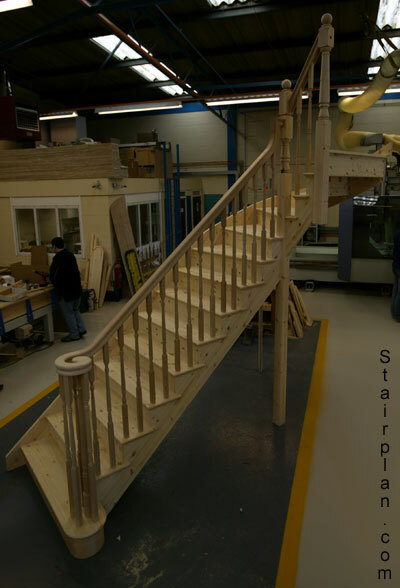 Here you can see a staircase that has the Volute and goose neck handrail details, this staircase also has a cut string detail.